Stanley's Reef Foundation (SRF), was created in 1992 when a volcano took out a dozen surf spots on the big island of Hawaii. Could lost surf spots be replaced? 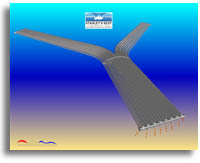 SRF's mission is to create a surfable wave using environmentally sound materials and methods. The Foundation maintains the belief that an artificial reef should be both safe and removable. High Density Polyethylene pipe is the inert safe building block for this modular reef that has been developed over the last 10 years. designed and tested. SRF wants to encourage the return of the extensive kelp beds with help from other non profits, universities and individuals. Section 227 is a specific section of the National Shoreline Erosion Control and Demonstration Program. SRF has applied to be one of the innovative private technologies that will be tested in the United States. This technology has been selected as a finalist in this federal project approved by Congress. SRF is waiting for the letter of approval to start. Permits take approximately one year to receive.